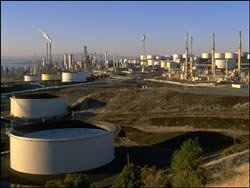 The dominant view of the origin of oil amongst western oil companies until 1969 was that it was due to the decay of living matter. Now other views are making themselves heard. To try and resolve the issue whether oil is biogenic (derived from living matter) or abiogenic (built up from primordial matter and therefore not from living matter) a Hedberg Conference recently took place. The issue was not resolved. This suggests that a third alternative is needed, especially as neither model fits into a young-earth scenario. The purpose of this paper is to discuss those naturalistic models, show that there are severe problems with both models, and offer a robust alternative which respects the geochemistry of oil, the known geology of rocks involved in the process, the Creator’s power, and the geological events surrounding the Noachian Flood. I have called it the “theobaric” model, meaning made by God. The oil existed in pristine state before the Flood, and moved during the Flood into the reservoirs where we now find it. This has interesting implications for Christian apologetics and the choice of Flood models. The purpose of this paper is to discuss the origin of oil and gas, collectively called petroleum because they are found in rock (petros). There are two models competing for attention in the secular world. The best known is that where living matter is assumed to decay and form oil—hence the name “fossil fuel.” The other model is that of an abiogenic origin—meaning that oil is directly produced from primordial matter. Because of the interest in the topic, a recent Hedberg Conference turned its attention to the topic, and a summary paper has now been produced (Katz, Mancini, and Kitchka 2008). The conference could not resolve the dilemma—“Which of the models is correct?”. Both models contain subjective assumptions, and so the answer may be neither model is correct, and that a third model is required to cope with all the known data. All three options are explored in this paper. The science is not particularly difficult. A basic knowledge of geology, a little physics, and some chemistry will suffice. The real problem for most readers will be the mental ascent needed to reject a naturalistic explanation for the origin of oil and replacing it with a biblical one, when for so long we have only heard about naturalistic models. The oil industry uses units that are not consistently imperial nor metric. Where I am quoting from a particular report I have used the units that the authors of that report have used. To one figure precision, 3 feet equals 1 meter, 5,000 feet equals 1 mile, 1 barrel equals 6 cubic feet. For further details, see Bradley (1984). Hydrocarbons (a dominant part of petroleum) are clearly identified as break-down products of organic molecules from plants. Hydrocarbons show optical activity. They rotate plane-polarized light indicating left-handed molecules are preponderant as found in living organisms. Hydrocarbons show preference for odd-numbered alkanes (which is considered to be a feature of “organic oil”). Hydrocarbons are found in sedimentary rocks rather than primary rocks. Hydrocarbons are found in the line of arcs which are deep-seated crustal structural features. Hydrocarbon areas tend to be rich at many depths. Deep hydrocarbons show no biological evidence (for example, optical activity or disparity between the even- and odd-numbered alkanes). Methane is found where a biological origin is not probable. There is no link between the hydrocarbon characteristics across different areas of the world with the geological column. There is associated helium (up to 10% in some U. S. reservoirs) alongside the hydrocarbons. Many gas reservoirs, particularly in Germany, contain considerably in excess of 50% nitrogen (Barnard and Cooper 1983), which is nonbiological. Other reservoirs in the U. S. contain consistent ratios of helium and nitrogen (Osborne 1986) which are also non-biological. There are also many Russian dry gas reservoirs which not only contain 20% nitrogen, but also 30% hydrogen (Smith et al 2005). There are also the thorny issues of mercury, vanadium and chromium within oils. Though they are present in North Sea oils, they are at relatively lower concentrations compared with world oil. These heavy metals are poisonous to life, but their presence calls into question both models for the origin of oil. Why have we not settled on one of the naturalistic models? It does not matter to many people. An individual can fill up with fuel at a garage, or turn on the central heating (oil or gas), and not even think about where the petroleum products came from. Even within the oil industry, engineers can work on a reservoir to extract all the oil and gas possible, and still not ask the question—how did they get into the reservoir? Admittedly, the regulatory bodies in the United Kingdom will have required oil companies to show, as a particular reservoir approaches exhaustion, that there was no other oil and gas within the region that could be extracted by their wells and other equipment. Only then would they have permission to abandon the project. To some extent, this requirement is driven by Gold’s point 6. While the reader may not be familiar with the detailed science in Gold’s list or read all the Hedberg Conference papers, it is obvious that neither model may be a robust explanation for the origin of oil. To investigate the topic we start with a consideration of what oil is, and the nature of the reservoirs where oil is found, before examining the details of the individual models. Finally, we shall offer an alternative to those two naturalistic models (meaning that they are set in a secular framework) which meets scientific and biblical requirements. It thereby has the potential to become a positive force in evangelism. Most of the examples on which the thesis of this paper is based will come from the North Sea and the wide range of reservoirs on the United Kingdom, Norwegian and Danish portions (Glennie 1998). This is because in a 31-year career in the upstream oil industry the author became intimately familiar with many of these reservoirs (see, for example, Fayers, Hawes, and Matthews 1981; Matthews, Carter, and Dake 1992; Matthews, Carter, and Zimmerman 2008) and the people who have studied them. However, there is no indication that any of the conclusions drawn from the North Sea are not appropriate to all other parts of the world. The first task is, however, to remind ourselves of how we use facts to support particular hypotheses. To support a particular hypothesis regarding the origin of oil we need a number of facts. However, these facts may not be sufficient to support an individual hypothesis. Consider the syllogism of Socrates (Chilingar et al 2005). The two facts, Socrates is a man, and all men are mortal, allows us to infer that Socrates is mortal. However, if we state that Socrates is mortal, and Socrates is a man, we cannot infer that all men are mortal from the available evidence. The premises are necessary, but not sufficient, to show that all men are mortal. Fig. 1. Alkane distribution of a typical light oil. To take a particular point about the origin of oil, the literature abounds with comments that certain oils contain biological markers. In reality, this statement is already an inference. We have taken a fact (that oils contain molecules that can be generated in the laboratory from biological material) and made two assumptions. The first is that the molecules in the sample of oil tested had a biological origin. The second assumption is an even bigger step—that all oil molecules had a biological origin. Circular reasoning is another problem that so easily creeps into scientific discussions. Examples will be discussed below. Crude oil is a natural multicomponent mixture (Chilingar et al 2005). The bulk of oil and natural gas consist of a numerically ordered sequence of hydrocarbons, which are molecules of hydrogen (H) and carbon (C) only. For convenience, it is typical for the hydrocarbons with N atoms of carbon to be written as CN. The names and brief properties of the smaller molecules are listed in Table 1. 4 Butane Gas, though liquid under light pressure. Oil and natural gas are found together without exception, though the proportions differ. See Table 2 for a typical industry classification. The contents of one reservoir may be dominated by natural gas, with only a fraction of one percent being liquid oil. These reservoirs may be referred to as dry-gas reservoirs (type 1). Examples include the giant Groningen gas field and the gas fields in the southern North Sea basin (Glennie 1998). The contents of other reservoirs may be dominated by oil (type 4 onwards), with perhaps only a few percent (by weight) being natural gas. Table 2. Hydrocarbon definitions (from Cornford 1998). The hydrocarbons from a reservoir consist mainly of a special group of hydrocarbons called the alkanes. On occasions, though not typically from the North Sea, the produced fluid will contain carbon dioxide, hydrogen sulfide, helium, hydrogen, and nitrogen. Putting a light North Sea oil into a gas chromatograph yields the result shown in Fig. 1 for the relative amounts of each alkane.2 Very small quantities of nitrogen, and in specific cases mentioned below, larger quantities of carbon dioxide, will also be present, but these are specific to particular areas of the North Sea (for example, Brae, see later). The nth alkane has the formula CnH2n + 2. Some are straight-chained (the normal alkanes). Others are branched (the iso-forms), with the lightest alkane that betrays this behavior being butane. In consequence they have slightly different thermodynamic properties (such as boiling point). Molecules such as alcohols and carbohydrates, though having a preponderance of carbon and hydrogen atoms, are not found in measurable quantities in reservoir hydrocarbons. The four lowest alkanes are removed at the reservoir production site, and sold as natural gas, or natural gas liquids (NGLs). The remainder, referred to as stock tank oil, to distinguish it from the fluid that emerges from the reservoir, is sent to the refinery. In a refinery, further separation occurs. Alkanes 6 to 10 typically form petrol (gasoline), alkanes 14 to 18 form diesel fuel, and alkanes 26 onwards form lubricating oil (Krauskopf and Bird 1995). The boundaries and purity are not precise. For example, in summer the refinery will include slightly higher alkanes in its petrol than in winter, because the variations in air temperatures cause changes to the optimum volatility. Other components of natural oil may include the benzenes, waxes, and the asphaltenes. Oil and gas reservoirs consist of a volume of porous rock (typically one to three miles beneath the ground surface). Fluids occupy the spaces between the grains of sand, limestone and/or chalk.3 Within the pore space there will be oil, gas, and water. Since oil is much lighter than water, there must be some means of retaining the oil in the reservoir. A typical oil reservoir maybe anticlinally shaped. The oil is prevented from rising out of the reservoir by an impervious cap rock. Oil is prevented from moving out of the reservoir sideways either by the shape of the anticline or some other impervious rock. Maureen is an example of an anticlinal reservoir which will be discussed later—see Fig. 2. Except for a few specific reservoirs, all the evidence points to oil having been generated elsewhere. Consider the assumption of oil being derived from the decay of biological matter. This biological matter initially resides in another rock formation (the source rock) and the oil generated in those source rocks later flows into the reservoirs where we now find the oil. In the case where oil is assumed to have an abiogenic origin, the oil is generated at depth and rises through the rock sequence in order to enter its present resting place. Fig. 2. Cross-section of the Maureen Reservoir. To understand the origin of oil (and gas) we need, as a minimum, to have a model of the origin of the host reservoirs. It is insufficient to have a model which may be able to explain the origin of the molecules that comprise oil, if that same model fails to explain how the molecules moved from the positions in the rocks where they were created (the source rocks or the depths of the earth) into the reservoirs where we now find them. The sufficiency conditions are not met. This is not the place to discuss the dating of rocks, but we have to respect the fact that radioactive decay rates have fallen during earth history (DeYoung 2005) and to that extent reservoirs are probably around 4,000–6,000 years old, rather than millions of years old. 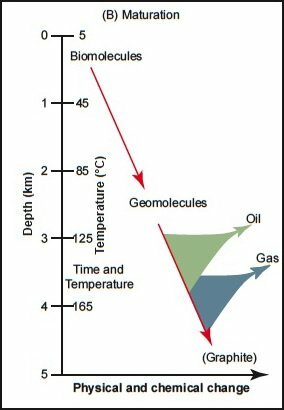 It is not foundational to the development of a new model for the origin of oil that the rocks are less than 6,000 years old, but as we explore the known facts about oil, we have to review the timescales under which oil and gas have moved within the rocks. The place to start is with a detailed discussion of the individual components of a reservoir. The sandstone rock grains that make up the reservoir are assumed to have come from erosion and weathering of topographic highs over a period of millions of years. It would appear that the required massive amounts of weathering cannot be completed in 6,000 years, which is a typical estimate of the age of the earth based on biblical chronologies. Of course, there could have been huge amounts of sediments on the pre-Flood ocean floor, put there when the land was raised by God on creation day 3 causing the original globe-encircling waters to be drained off into the ocean basins. Estimates of the time to weather 1 mm of fresh rock to kaolinitic saprolite are at least 20 years (Krauskopf and Bird, 1995, p. 326). Now while that may suggest that the earth is millions of years old, if sediments are the product of weathering, then the problem is that of explaining how, during the long periods of weathering of the metamorphic rock to sandstone and clays, the substances have not become intimately mixed in rivers, lakes, and on the sea bed. Typical attempts to reconstruct reservoir history (paleo-reconstruction) is a near-impossible forensic problem. Apart from vague mentioning of topographic highs, the literature contains very little in the way of useful suggestions in a uniformitarian sense. Furthermore, there seems to be a contradiction with this idea. The slumping in Maureen (see later) and the water-escape features in Magnus (see later) point to rapid deposition, possibly as short as a few minutes. The history of the rock grains. As grains of rock are deposited, they may be compacted by the weight of the overburden. Additionally, the water surrounding individual grains will rise in pressure, and some of the rock grain material will therefore be taken into solution. That material will be re-deposited either elsewhere or back on the same grains in a crystalline form should there be inversion of the formation. (There is plenty of evidence of inversion of oil reservoirs.) The net effect is that the rock grains we now find in a reservoir are not the same, chemically or morphologically, as those at deposition. They may also be clay overgrowths and/ or fluid inclusions, all of which help to unravel the history of the rock and the fluids that were once in the reservoir but are no longer there. Compaction and oil-emplacement. In some reservoirs, compaction of the rock grains has not been fully achieved, even though such reservoirs are many miles below the surface. This means that the rock grains are not fully supporting the formations above. Part of that support comes from enhanced fluid pressures. Wilson (2005) has pointed out the oil must have entered many types of reservoirs while the reservoirs were at a shallow depth, at which point there is only partial compaction.4 This causes him a problem, since the oil must leave the source rock5 early in its supposed process of catagenesis (see later). His listed examples include the Ekofisk reservoir (see later), but there is similarity with the Brae and Miller complex listed later. We will return to the topic under the heading of “secondary migration” (see later). Fluid inclusions and fluid history. One result of the growth of original rock grains is that the growths can trap small quantities of water, gas, and oil. These can be used as diagnostic tools for understanding the fluids that have passed through the reservoir (see Krauskopf and Bird 1995, p. 508 for a general introduction). For a reservoir specific example, see Karlsen et al 2004, from which Fig. 3 was taken. The cap rock is what is there to prevent the petroleum from escaping to surface. Anything impervious will retain the oil and gas, at least over short periods of time. Mudstone, clays, and evaporites are satisfactory in this sense. Fig. 3. Fluid inclusions in sandstone (from Karlsen et al. 2004). In traditional models of the origin of oil, the cap rock is considered to be in position as an impervious layer before the oil enters the reservoir. Otherwise it will leak. Why then, in many examples, does the cap rock contain hydrocarbons? 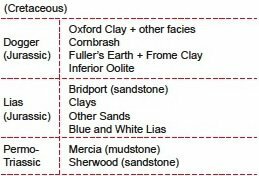 If we adopt the model that oil is generated in the source rocks, then because the Kimmeridge Clay is the source rock for the South Brae field, then the Clay is both source and cap rock. That, of course, begs the question as to how the oil was ejected downwards against gravity, when we would expect it to be easier to move the oil upwards into the next formation. Møller-Pedersen and Koestler (1997) have edited a major study on the integrity of cap rocks. Kettel (1997, p. 175) is puzzled why there is twice as much methane in the salt-seal cap rock of a reservoir as in the reservoir. In his view it has to be diffusion, because he is unwilling to countenance the mechanisms that occurred during the Flood. The gas-chimney over the Ekofisk reservoir is a consequence of fracturing of a whole series of rocks over the reservoir. In summary, something does not quite fit with regard to the conventional ideas about cap rocks, though it does have a close link with Wilson’s (2005) thesis. We will return to the issue later. All the oil and gas reservoirs contain water. Some of this exists in the oil column, suspended intimately with the oil by capillary forces (Matthews 2004). At the base of the oil column will be an aquifer of additional water (for example, see fig. 2). There are wide variations between the compositions of formation waters, and these differ dramatically from seawater according to a survey of U. S. fields by Collins (1984). A similar situation prevails in the U. K. North Sea (Fayers, Hawes, and Matthews 1981). Most formation waters are quite saline (typically two or more times the content of NaCl than seawater, but some are almost fully saturated). There is a relative absence of sulfate(SO4) and sometimes a preponderance of barium (Ba) and strontium (Sr) (Warren, Smalley, and Howarth 1994). There is also quite a variation between the formation waters of reservoirs of similar age. In terms of uniformitarian timescales, this is a contradiction that the sedimentation took place in seawater that had had plenty of time to approach near equilibrium. We give a few examples of reservoirs from the North Sea. The aim is to show that the problems of the origin of oil are not just about the oil as a fluid, but the origin of the physical structure of the reservoir and all fluids within it. This has already been hinted at in the literature (Matthews et al. 2008). The data will be used to construct a new model of the origin of oil. This particular section is based around reservoirs the author has studied in a commercial environment, but all the data quoted is taken from published sources. 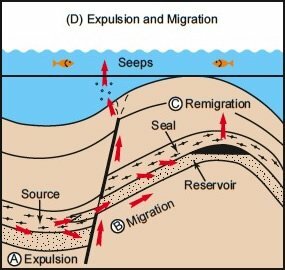 A few other reservoirs will be discussed later in the section on secondary migration. The Maureen reservoir is a sandstone reservoir (Cutts 1991) and anticlinal in shape in U. K. block 16/29. The cap rock is a mudstone (see fig. 2). It contains a light oil (type 2 of table 2), with a total volume around 400 million barrels.7 The water is quite salty (twice that of seawater). 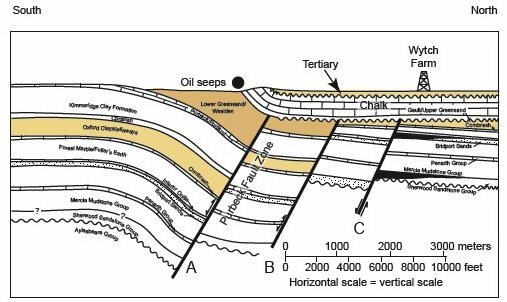 The reservoir sandstone is assumed to have been deposited as a submarine fan, but the timing of the emplacement of oil in relation to deposition, and central uplift (creating the anticline), is the subject of continuing speculation (Matthews et al. 2008). There are a number of slump features within the reservoir. Within the main body of the sandstone there are some major volumes of shale. In other places, the sandstone has been cemented by calcite, so that the porosity is destroyed. The chalk, judged to be contemporaneous with that at the Ekofisk reservoir, contains oil, but the permeability there is so low and little of the oil has been extracted. We will return to this intriguing aspect in the discussion about secondary migration. There is oil beneath the main sandstone and chalk formations in several independent accumulations (Gold’s point 6). However, there is a relatively insignificant amount of oil in the surrounding areas, and the reservoir is not filled to spill-point. Fig. 4. Generalized stratigraphy in the Wytch Farm area. The Wytch Farm reservoir is the U. K.’s largest on-land oil field, located in southeast Dorset. Several reservoirs are stacked on top of each other (Gold’s point 6). The oils are all of type 4, but differ significantly within the broad classification of Table 2. A generalized stratigraphy is shown in Fig. 4. Starting from the bottom, the deep (1600 m) Sherwood Sands (quoted as Permo-Triassic) contained about 750 million barrels of oil. The sands consist of a variable sequence of floodplain deposits, sandflat and lacustrine deposits, sheetflood deposits, channel-fill deposits and aeolian deposits (McKie, Agget, and Hogg 1998). The reservoir is sealed vertically by the Mercia mudstone (fine-grained). A mixture of geological faults and a dipping structure seal the reservoir laterally (see fig. 5). The Bridport Sands (quoted as Jurassic8—Underhill and Stoneley 1998) contained about 120 million barrels of oil. Those sands are considered to be diachronous. Above the Bridport Sands is the Inferior Oolite. In places the Oolite contains small amounts of oil, but generally it seals the Bridport reservoir with support from the Fuller’s Earth. A small amount of oil is present in the overlying Frome Clay member. Apart from relatively small oil fields in the vicinity, nothing the size of Wytch Farm is encountered for around 1,000 km to the northeast (for example, Brae). Further details of Wytch Farm will be discussed in the section on secondary migration. Fig. 5. North-south cross-section through Wytch Farm (based on Underhill 1998) as presently interpreted. The South Brae reservoir (Turner et al 1987) in U. K. block 16/7 differs from Maureen in several respects. Although sandstone is the porous medium, it is conglomeratic. In conjunction with another paper by Harris and Fowler (1987), a depositional model is provided, but collectively the two papers fail to provide a single concise model of how South Brae came to be. The diagram in Harris and Fowler (1987) shows an attempted paleo-reconstruction during deposition, but the diagram only goes a short way into what is called “the hinterland,” with supposed “energetic streams” supplying the sediment into a subsiding basin.9 The Turner et al. (1987) paper mentions the need to envisage a “relatively rapid waning of coarse-clastic supply to the fan” twice during the deposition of the sediments. Such abrupt cessation does not tie naturally with the Harris-Fowler diagram. Whilst the oil is also light and has a volume of around one billion barrels, it contains a moderate amount of carbon dioxide (≥ 20 mol %). It is also at a high pressure, which is a puzzle for uniformitarian timescales.10 The water in the reservoir contains moderately large amounts of barium and strontium, which would be unusual if the deposition took place within a normal seawater environment.11 Finally, the whole of the reservoir is surrounded by a shaley material, called the Kimmeridge Clay. To the east of Brae, the Miller reservoir exists with a carbon dioxide concentration slightly less than than of Brae. A syncline of sandstone provides a hydraulic connection between the two. The Magnus reservoir in U. K. blocks 211/12 and 17 also contains a light oil (type 4 again), and the fluid pressure is high (De’Ath and Schuyleman 1981). In round figures the volume of oil is again one billion barrels. Between the sand grains there is a large amount of clay. The clay (illite) has a hairy form. There is more clay at the bottom of the reservoir than at the top. Within the sandstone, there are many water-escape pipes, dish structures, and sand injection features. The Alba reservoir, in U. K. block 16/26, is sandstone, rather like an elongated pod within an area of mudstone. 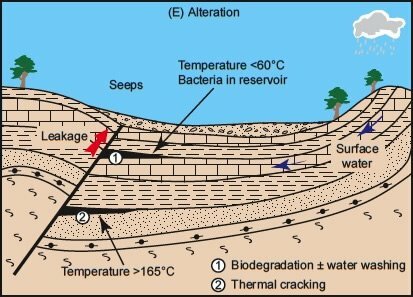 Sand injection structures exist above the reservoir, and there is evidence of extensive re-mobilisation of the sands (Hurst et al 2003). The oil is unusual. It consists of a heavy oil (type 7), but the quantities of methane are high. To that extent, Fig. 2 is not strictly relevant. The standard reasoning for the lack of low-weight alkanes is that the oil was light at the time of emplacement, but has been bio-degraded. It may be difficult to sustain that argument on the basis of a young-earth timescale, the reaction kinetics, and the location of the reaction-byproducts. The Ekofisk reservoir is a chalk reservoir in the Norwegian block 2/4. It is at high pressure, and the oil is a condensate (type 3). Above the reservoir in the cap rock is a gas-chimney. The depletion of this reservoir caused the seabed to sink (Zoback and Zinke 2002), because as the hydrocarbons were withdrawn, the fluid pressure fell, and the chalk particles became compacted. The compaction was transmitted back to the seabed. The biogenic model of the origin of oil (and gas) is the one most commonly held in the West.12 There are eight major stages in the biogenic model of the origin of oil. If any one of the stages can be shown not to have occurred, then the whole model fails the test of sufficiency. It is wrong. Some of the stages are shown in Fig. 6, based on Cornford (1998). Fig. 6. Schematic diagrams showing how oil is supposed to have formed (based on Cornford 1998). First, the organic material (biological remains of life) must be deposited in large volumes in a matrix of shales and silts. The carbon content is judged to be the most important part. This mixture of organic matter and shales, and/or silts, is called the source rock, though at this stage it does not contain oil. Second, the material must be lightly buried where it can undergo a process of diagenesis (so that only the insoluble kerogen part of the organic matter is left). Section A of Fig. 6 shows the collection and burial of the biomolecules. Third, the host formation must then be buried to depth. Fourth, the kerogen must undergo catagenesis (changing into molecules of oil). As part of this process, some of the chemical bonds in the kerogen must be broken to form bitumen (Barker 1996, p. 64). These two stages are shown in section B of Fig. 6, though the provenances of the sediments that bury the source rock are not shown. Fifth, the oil must not dis-associate. Sixth, the oil must be released from the source rock. These two stages are shown in section C of Fig. 6. Seventh, the oil must migrate long distances to the target reservoir. Eighth, the target reservoir must be capable of accepting and then retaining the oil. These two stages are shown in section D of Fig. 6. Each of these stages is problematical, and there is often circular reasoning adopted to justify a particular stance. Also, many of the problems are worsened by the need to respect the fact that the earth is young. This is not the place to discuss the age of the earth, though we are getting hints that sedimentary processes are rapid (for example, the energetic streams of Brae, high fluid pressures, and unequilibrated formation waters). The reader is referred to DeYoung (2005) for details about radiometric dating which supports this assertion. Note that most authors will add a ninth stage, that is, alteration of the hydrocarbons when they are in the reservoir. This is shown as section E. This stage is germane to the origin of the oil in the Alba reservoir (see later). We start with organic matter in the source rock which has molecular weights in the region of 106, and the need to reduce the bulk of this to values below 1,000, and even as low as 16 (methane). Otherwise, we do not get the alkane distribution shown in Fig. 1. Finally, the molecules of petroleum must find their way into the host reservoir and stay there until recovered by human activity. We list and discuss the individual problems. The collection of sufficient organic matter within shales and silts is a pre-requisite for the formation of oil to be explained by this model. (The possibility that coal has sometimes acted as a source rock is considered later.) The organic content of ocean sediments, such as in the North Atlantic, is around 0.1% by weight (Hunt 1979). Most other places are less than 1%, except for anaerobic areas such as the Black Sea with values of 6 to 15%. It is only with these last values that, even in the most unprescriptive conditions that have been suggested as part of this biogenic model, enough organic carbon can be found to make useful amounts of an oil-like substance. There are differences in the amount of organic carbon in recent and ancient sediments. The former, as mentioned above, are generally below 0.1%. The ancient sediments have higher levels of organic matter (up to 3%). Furthermore, if we wish to sustain the model that oil is biogenic, the values must have been much higher at deposition, because these sediments are assumed to have yielded up some of their mass to form oil, which subsequently left the sediment. In conclusion, the present is not the key to the past. Even if all other parts of the biogenic model for the origin of oil can be justified, the model as a whole is not tenable. The silts and shales containing organic matter are now assumed to have been buried to a shallow depth. Here, in the absence of oxygen, it will undergo a process of diagenesis (Hunt 1979). The reducing conditions will remove oxygen from the organic matter to convert it to kerogen. There are few problems with assuming that this step of the long conversion process did not work, but that is only true for uniformitarian timescales. A very specific burial history must occur for the kerogen to be heated to the correct temperatures for the correct amount of time to form oil. The completeness of the geological record is a matter of considerable uncertainty (in uniformitarian terms [Barker 1996, p. 91]). Questions about how much sediment was deposited over the source rock, and how much erosion of those sediments took place (which controls the burial history), cannot be answered. is, in my opinion, characterized more by unfulfilled promises, remaining questions, lingering doubts, and a sceptical base of potential clients than by its successes. And, of course, some of the “successes” may be accidental. No one is mad enough to use basin modelling to predict where oil is not, and then spend £10 million on a well to prove that basin modelling correctly predicts the absence of oil. So in a “Popper” sense, we cannot easily falsify the model (Popper 1994). The problem of timing and burial is even more critical for the theory of biogenic oil generation if we insist (quite rightly) on young-earth timescales where much geological history is condensed into a period of perhaps as short as 370 days (by believing that most fossiliferous sediments are the result of Flood geology) or a few thousand years (that some fossiliferous sediments are due to Recolonization geology [Bush 2008]). Assuming that we have the necessary kerogen at the correct depth, and therefore exposed to the correct temperatures, this now has to be converted to the oil described previously. In the laboratory it is possible to convert kerogen into an oil-like substance. The laboratory process only works provided intermediate reaction products (oxygen, nitrogen, and sulfur) are removed as the process continues. We have no idea how nature cooperated in the removal of the intermediate reaction products. If it did not, the reactions could reverse, and we would still have only kerogen. Alternatively, we would expect to find major amounts of nitrogen. The oxygen might be expected to react and form carbon dioxide and water. No waxes are generated. Admittedly they are only a small fraction of the components of most oils, but their absence is diagnostic. No asphaltenes are generated. Admittedly they are only a small fraction of the components of most oils, but their absence is also diagnostic. The alkane distribution is completely different to that of oil in the reservoir. No alkanes lower than number 15 are generated. No even numbered alkanes are generated. The sheer disparity between what is found in reservoirs and what we have produced is shown in Fig. 7. Fig. 7. Reservoir hydrocarbons compared with biogenic oil using gas chromatography (green bars are reservoir oil, yellow bars are biogenic oil). In summary, we have managed to generate an unusual set of molecules which have some characteristics of crude oil. However, in comparison with real reservoir oil, the bulk of the hydrocarbons are missing. And they are the ones most useful for human life (heating, plastics, petrol, and diesel). This part of the model, as for other parts, therefore fails the sufficiency test. Assuming that oil has been produced from organic matter, it now has to leave the source rock. Five mechanisms have been suggested, but each suffers from problems. Hunt (1979, p. 207ff) lists and comments on the first four. Migration in water. Migration of oil in solution of water has been suggested. However, the solubilities are low, especially for molecules heavier than methane. Migration in gas. Migration of oil in the gas phase has been suggested. However, the problem is then explaining why large volumes of oil are found independently of large volumes of gas. Single phase movement. Oil phase migration as a single phase has also been suggested. However, source rocks have very low permeabilities (Okui, Siebert, and Matsubayashi 1998, p. 46), and the oil does not move in any of the laboratory experiments that have been set up to check this mechanism. What Okui, Siebert, and Matsubayashi (1998) have found is not unexpected. The author was involved (Matthews et al, 1988) in experimental and mathematical modelling studies to determine how internally generated phase saturations could flow. Even within highly permeable rock, large volumes have first to be created. There would also be large quantities of oil and gas left in the source rocks if this biogenic model were correct. Migration by diffusion. Migration by diffusion has also been suggested, but Hunt (1979) offers no comments for or against. In a young-earth scenario it certainly would not work when timescales have been reduced by around five orders of magnitude. This section on secondary migration will be one of the longest. This is because there is extensive literature on the subject and it has a closer association with Flood geology. When a new oil reservoir is found, apart from asking the engineers how to get the oil out, one of the next questions will be to ask how it got there. If the petroleum geologists can understand the tracks and conduits by which the oil moved from the source rock to the reservoir, they may have a handle on where else oil from those source rocks went, and this in turn gives them a clue as to where to explore for that oil. However, as we shall see, it does not work that way. One looks for enlightenment in the proceedings of an equivalent conference 10 years later (England and Fleet 1992) and finds nothing except for a reiteration of the problems of 1980. Even after a further 12 years, nothing substantive was offered at a follow-up conference.17 The suite of papers has since been published (Cubitt, England, and Larter 2004), and papers rather steered away from the identifying the conduits and tracks of the supposed migration except by oblique methods. To that extent, the studies have a questionable value. We will first examine some slightly less general statements about secondary migration to show that it is a worldwide problem. We will then examine some of the reservoirs that have been described above. In a desired model of secondary migration, faults appear to be conduits for migration at some times and barriers at others (Barker 1996, p. 384). There is no logic to this, other than to get the petroleum into the reservoir by a secondary migration model, and then keep it there. Oil cracking to gas leaves bitumen. Since in west Africa (Barker 1996, p. 288ff) bitumen is found above gas reservoirs, irrespective of where the supposed source rocks were, the lighter gas should be above the heavier bitumen. We do not have that. In the North Sea, oil has to penetrate Heather shales in a downward movement to enter the huge Brent reservoir on the basis of the assumed source rocks above the reservoir (Barnard and Bastow 1992, p. 177). The same would be true of many of the other Brent-type reservoirs, such as Statfjord (Morton et al. 1992). We don’t have a mechanism. A catalog of other North Sea reservoirs (Alba, Gullfaks, Ekofisk, Frigg, and Fulmar) where, in spite of major commercial activity in the areas, no understanding of secondary migration has been obtained (Matthews 2004). Reconsideration of Wytch Farm. The quotation by Roberts and Cordell (1980) (“models of secondary migration have been based on interpretation of factual observations sponsored and enhanced by imagination”) can be illustrated by the models of secondary migration suggested for Wytch Farm. The authors emphasise that the explanation is hypothetical, and the number of questions raised by this explanation points to a need for a fundamental rethink along the lines advocated in this paper. Fig. 5 shows a simplified form of the reservoir cross-section from Underhill and Stoneley (1998) as it is interpreted today. Fig. 8 shows a simplified paleo-reconstruction at the end of the “Cretaceous”. The problem is to explain how oil from the supposed source rock beneath the Bridport Sands in the south moved three miles to the north to enter Bridport and Sherwood sandstones. Furthermore, the sections of these sandstones between faults A and C are not oil-filled. In the early Cretaceous (Gault and Chalk are not yet deposited), faulting results in the downthrow of reasonably horizontal strata to the south. (This has been labelled as Fault A.) The fault, which is listric,18 allows the oil in the source rock to rise past the Clays and enter the Bridport Sands to the south of the fault, because near the fault the Bridport Sands are dipping north. Some oil will continue to leak to surface, but there is no explanation as to why petroleum does not enter the Bridport Sands to the north of the fault. Nor do the authors mention the thorny issue of how primary migration occurred. Leakage effectively ceased when the overlying Upper Cretaceous deposits were emplaced. At this point (late to end Cretaceous) further tectonic activity (a pericline is forming in the south) tilts the southern portions of the Bridport Sands the opposite way (to the south). This allows the petroleum to move north back towards the fault, rise through the fault, and enter the northern portions of the Bridport and Sherwood Sands. This is between Faults A and B on the Figs. 5 and 8. Fault C now becomes sealed, though no explanation concerning these crucially timed events is offered. In the early Tertiary oil is “lost” in the blocks between faults A and B, and B and C to surface, though this is not really consistent with point number 2. Fig. 8. North-south cross-section through Wytch Farm (based on Underhill and Stoneley 1998) as interpreted at the end of the “Cretaceous”. The red arrows indicate the inferred migration routes. He is clearly uncomfortable with secondary migration and the specific suggestions that he made with Stoneley in his earlier (1987) paper on Wytch Farm. He also voted in my informal survey at the Petroleum Geology Conference in 2003 (see footnote 12 earlier) in support of Gold’s idea that oil is not biogenic. A further point that strengthens the current argument that secondary migration of the envisaged form does not occur is that if the Underhill and Stoneley (1998) model were correct, then there is good reason to expect other pockets of oil in the area. To quote Underhill and Stoneley (1998), there was “relative disappointment of exploration wells” when extensive exploration took place around the area of Wytch Farm. Gullfaks. Gullfaks is a giant Norwegian reservoir (over three billion barrels). With such a huge amount of oil that has supposedly migrated from the source rocks, the argument is (if you accept the paradigm that oil is biogenic) there must be other small accumulations of oil in the area. Larter and Horstad (1992) brought together the evidence. The authors briefly show that it is impossible to confirm or identify the movement of oil through the “necessary” conduits between the source rock and the reservoir. However, they claim that they can identify the keyholes that allowed oil to enter the reservoir by geochemical signatures of oil already in the reservoir. This is done on the basis of looking for immature and mature pockets of oil. But the concept of immature and mature oil only arises through the a priori assumption that oil is biogenic. That paper thus proves nothing. Alwyn. We have briefly referred to the work of Jourdan et al (1987) on quartz overgrowths previously. A later paper by Hogg, Selliers, and Jourdan (1992) provides additional data, specifically on the Alwyn reservoir. There are also a good selection of photographs (some color) and labelled diagrams. Smørbukk and Smørbuuk Sør. Smørbukk is another of Norway’s giant hydrocarbon fields. Karlsen produced a poster display on fluid inclusion work at the 2003 conference on Geochemistry and Reservoir Engineering. Earlier studies on the reservoirs had supposedly shown that oil entered Smørbukk from the west, where there is now a sealing fault. On that basis, wells were drilled to the west, because if oil had filled Smørbukk from the west, there ought to be pools of oil still there. No oil was found, but the sand grains showed fluid inclusions (fig. 3). As a session chairman, Karlsen admitted that he had come to the conference hoping for some answers, but was going home with more problems than he had come with. The failure of drilling to find the conduits by which oil entered Smørbukk meant that the engineers had to use indirect methods to try and understand how oil entered Smørbukk. Inevitably these were based on geochemistry, and the principle that oil has a biological origin, and therefore shows different levels of maturity. The authors offer no simple explanations as to how oil-filled inclusions occurred. We are reminded that quartz is naturally water-wet21 so the oil does not stick to the grain surfaces. However, if events were rapid, then oil droplets could be trapped during precipitation of the quartz around them. Stokes Law shows that oil droplets of size = 10 μm will not rise rapidly. 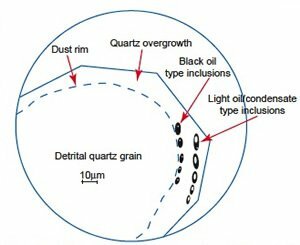 Several levels of oil-filled inclusions are found, suggesting that different types of oil were passing by at the same time as the silica-rich fluids were passing. Smørbukk Sør contained a reduced number of inclusions. This supposedly testifies to the later filling (3 million years ago) of Sør from a basin between Smørbukk and Smørbuuk Sør, whereas Smørbukk filled supposedly 50 million years ago. In summary, we appear to have been presented with a series of facts and a forced interpretation based on an a priori assumption that oil is biogenic. Troll. The Troll field is a Norwegian gas reservoir. The fields are apparently filled to spill-point, and have a tilted oil-water contact implying active migration (Goldsmith 2000). On the basis of an inferred migration route, a well (31/6-3) was drilled but found no hydrocarbons. This failure to find more reservoirs “acted as a challenge to seek alternative migration routes where “intuition” suggests that there should be a migration path.” That paper concludes with the statement that “Troll may be a unique example of a field that is apparently full to spill, but not spilling” (into other reservoirs). That use of “intuition” failed, because it was based on long timescales. We need the biblical fast-Flood model. An independent assessment of secondary migration. There are further problems that have since been identified concerning secondary migration. Oil has to enter the target reservoir when the reservoir is at shallow depth (Wilson 2005). To that extent, the origin of oil has to be discussed alongside the question of the origin of the reservoirs. We shall return to this point later. Although timescales for secondary migration are not a specific problem for those who adopt an old-earth scenario, they are for those who believe that the age of the earth is less than 10,000 years. The issue of timescales applies in several areas. There is the catagenesis, which, even if we accept works at low temperatures (~100°C), does not deliver the oil volume within 10,000 years. No one has demonstrated primary migration, so we cannot put a timescale on that. On secondary migration and the way the oil equilibrates chemically in a typical reservoir, we can put timescales. A similar problem is present in the Moretti (1998) paper, because she considers that there are millions of years available to charge reservoirs when there are not, otherwise they cannot be filled on the basis of the known hydraulic properties of faults. “Porphyrins” are present in many oils and the claim is made that they have a similar basic structure to those of chlorophyll from plant material. Krauskopf and Bird (1995, p. 396) state that this is “a piece of chemical evidence that petroleum must be chiefly of organic origin.” But what do these and other authors mean when they declare similarity? Krauskopf and Bird admit that some of the side chains are missing in the petroleum “porphyrins” and further that the magnesium in the chelate ring (in plant porphyrins) is either absent or replaced by a heavier metal such as vanadium or nickel in the supposed petroleum equivalents. So at a biological level (which is the essential test that determines whether the oil is of organic origin) the two are not similar. Magnesium is a light metal essential to the chemistry of life whereas nickel and vanadium can be poisonous. Thus, innocuous statements (that there is similarity between the structures of porphyrins from plants and the same substance in oil) are insufficient to show that oil is of organic origin. To clinch the point that the presence of “porphyrins” is not an indicator of an organic origin for the bulk of oil, we note that there are no recorded examples of pure plant porphyrins being found in oil nor of laboratories successfully converting plant-porphyrins into oil-porphyrins. Should these statements ever be successfully challenged, there are still the other seven or so problems with the organic explanation for oil in reservoirs listed above which rule out (on a sufficiency basis) the idea that the bulk of oil has an organic origin. There are many references to coal being seen as a source rock for oil (for example, Cornford, 1998). As far as the North Sea province is concerned, in the Carboniferous the coal beds are seen as the source of hydrocarbons in the gas fields of the southern North Sea (Besley 1998). In the Brent province, the mid-Ness shale which separates the upper part from the lower part of many reservoirs contains coal sequences (Morton et al 1992). Undoubtedly, samples of coal could, under controlled laboratory conditions, be turned into a partial set of hydrocarbons. That is a necessary requirement, but not a sufficient condition, to sustain the argument that the bulk of oil is biogenic in origin. Ultimately, coal can be ruled out as the source rock for the bulk of hydrocarbons in proximity to coal beds on the basis of the problems described above with reference to the supposed clay, shale, and silt layers being source rocks. The geochemistry does not have to be explored in detail when migration is a fundamental problem of getting hydrocarbons out of the source rocks and into the reservoirs. The other problem with suggesting that coal can be a source rock for oil is the question of the origin of the coal. The secular model is that coal is formed from organic matter in peat swamps over long periods of time. Within a Flood geology paradigm, we simply do not have the years available, but they are not necessary if the coal beds formed within the Flood year from the destruction of pre-Flood vegetation. There appear to be too many subjective assumptions regarding the possibility that the bulk of oil is of a biogenic origin. A few percent of certain alkanes may be of a biogenic origin, but it is misleading to say that these are “fingerprints” telling us about the origin of oil. The “fingerprints” are not an integral part of the bulk of oil. To that extent, we need now to turn to the other secular option advanced for the origin of oil. The idea that oil does not have a biological origin has been prevalent amongst Soviet block countries for perhaps the last 100 years. The reason is that many of their oil and gas fields are either in metamorphic or igneous rocks, or seemed to have no biogenic source rocks beneath them because the basement rocks were crystalline. The idea has been promoted in the West more recently by Gold (1979, 1987). Two things would have pointed him in this direction. First, Thomas Gold, along with Fred Hoyle and Herman Bondi, are better known for their work on radar during World War II, and their subsequent studies in astrophysics. They promoted the idea that the universe is self-generating. It is then a short step to suggesting that hydrocarbons are self-generated. They pointed out that there is spectral evidence for hydrocarbons on astronomical bodies. Second, Gold recognized that volcanoes discharge many complex molecules (Gold, 1979), and because these have no obvious biological origin, they must have been either primordial, or constructed from smaller primordial molecules in a process which he calls abiogenesis. The fact that the geochemistry is not described in detail has made his theory difficult to accept in the West (see for example, Cornford, 1998), but the situation is not that simple, as shown by the summary of the 2005 Hedberg Conference by Katz, Mancini, and Kitchka (2008). Within the oil industry, some may argue that oil is of biogenic origin. But the fact that we have shown that huge volumes of oil, supposedly the result of biogenic origin, cannot be explained in this way means that an alternative explanation for oil is needed. To that end the abiogenic origin must be considered, even if we do not end up with the details as Gold suggested. As a very minimum, for an abiogenic model to be acceptable, we need to explain the missing alkanes (below C15) which are not formed by biogenesis. We do not have to find large volumes of organic matter, since this is no longer the precursor material. We do not need diagenesis. We may not need a very specific burial history. We do not need the doubtful thermodynamics of catagenesis. We do not need to find mechanisms that would release oil from shales. We do still need a mechanism for secondary migration (moving oil from the point of its origin to the host reservoir), but Gold and Soter (1982a, b, 1984/1985) suggest that a series of fracturing episodes can perform this operation. Hydrocarbons are found in the line of arcs which are deep-seated crustal structural features. I am not familiar with any examples, but the evidence points to little or no precursor sedimentary rocks in these areas, so the idea is at least attractive. Hydrocarbon areas tend to be rich at many depths. (Examples already quoted include Maureen and Wytch Farm.) This implies a localized source of hydrocarbons with vertical puncturing to allow hydrocarbons to move upwards, but Gold cannot explain the variations in alkane distributions that are seen in vertically stepped accumulations, though natural chromatographic separation during fluid movement through the rocks could play a part. Deep hydrocarbons show no biological evidence (for example, optical activity or disparity) between the even and odd numbered alkanes. The hydrocarbon molecules are therefore, in some sense, primordial. Methane is found where a biological origin is not probable. The planet Jupiter is believed to be covered by methane, so therefore the origin of that must be primordial. However, the more complex heavier alkanes, waxes, etc. are apparently not present. There is no link between the hydrocarbon characteristics across different areas of the world with the geological column. Although the point is a valid one, Gold may be making too much of this, because in his evolutionary mind-set he may be thinking that types of animals and plants varied significantly (thereby controlling the compositions of oil they produced after catagenesis) during geological history. There is associated helium in some U. S. reservoirs. Helium is assumed in Gold’s mind to be the next building element after hydrogen in the total collection of the periodic table. What Gold forgets is that since there are no stable elements of (atomic) mass numbers 5 and 8, construction of the elements by this route is not tenable. In particular, therefore, the origin of nitrogen (atomic number 14) in the German reservoirs is unexplained. The Geological Society memoir by Petford and McCaffrey (2003) is one useful source of information on the abiogenic model of the origin of oil. The memoir is principally about hydrocarbons in and around igneous rocks, rather than a detailed discussion of abiogenic hydrocarbons. It is admitted by authors of key papers, such as Potter and Konnerup-Madsen (2003), and Schutter (2003), that some of the hydrocarbons in igneous rocks probably have a biogenic origin. To that extent they are not providing an explanation for the origin of oil at all, because they fail the sufficiency test—their requirement does not fit with the analysis that we have concluded previously. At this part of our study, having rejected biogenic oil, we are therefore relying entirely on an abiogenic process to explain alkanes up to C15 and even-numbered ones thereafter. Schutter (2003) reviews many reservoirs that are supposed to have hydrocarbons in them that have an abiogenic origin.22 Some of these reservoirs are not of trivial size. He notes one giant reservoir in Java having over one billion barrels of oil in place. Generally there is a “lack of rigorously documented geochemistry” which prevents us from being convinced, even before we get to the detailed reasoning behind the suggestion that abiogenesis is a viable process, that the hydrocarbons are not abiogenic. Specifically he has said, “Many more questions arise than answers exist concerning hydrocarbons in and around igneous rocks”. Synthesis by the Fisher-Tropsch process during post-magmatic alteration processes. Suggestion 2 can be demonstrated in a ternary diagram (with vertices C, O and H) with specific temperature and pressure histories, but as to whether the history of rocks allowed this to happen to produce the particular distribution of alkanes that we cannot explain biogenically is an open question. Suggestion 3 is the most favoured in the literature, but in view of the fact that this still requires a geological history that allows the Fisher-Tropsch process to occur, as if it were an industrial process with operators controlling the individual stages of the process, the suggestion remains contentious. There appear to be too many subjective assumptions regarding the possibility that the bulk of oil is of an abiogenic origin. A few percent of certain low numbered alkanes may be of an abiogenic origin, but that is all. We have two secular theories for the chemical origin of the hydrocarbons, and the methods by which it may reach reservoirs. There are a catalog of problems with the biogenic model, and a catalog of guesswork as to how abiogiesis assembled complex hydrocarbons, waxes, etc. Both models involve “geological timescales” of millions of years. Reservoir paleo-reconstruction cannot be performed. There is no a priori geological history of the reservoir rock to support the geochemical history. Guesswork has to be used to explain events surrounding the emplacement of the reservoir cap rock. Quiet, long timescales cannot explain the variability of the formation waters. We have no uniformitarian explanation for the oil emplacement whilst the reservoirs are at shallow depth. Therefore, there must exist another explanation. The two models that have been proposed have been based on an implicit assumption of naturalism. The danger that many people see if a non-naturalist explanation is allowed in science is that there are unattractive philosophical consequences (Johnson 1998, p. 51). Freedom to ignore a creator may be more important to scientists and engineers than to establish the truth about oil and gas. However, the question that is not being asked is “how did life come to be?”. We have been offered an answer that a priori excludes anything other than naturalism. The remaining option is that life was directly created by an intelligent designer. Many have taken that route and accepted that, in view of the problems with Darwinism (and its modern versions) and punctuated equilibria, life was directly created by an intelligent designer. We need to apply this kind of thinking to oil and gas. The American Association of Petroleum Geologists produces a technical Bulletin which generally contains articles on the geological origin of oil, and trying to trace the source rocks. There is also a monthly magazine (Explorer) which contains oil industry news items and a forum for readers’ letters. In 2005, a series of letters appeared, apparently prompted by a high-profile author criticizing creationism in an earlier article. A number of creationists (they appeared to be old-earth creationists) wrote letters (which were published), and these were interspersed by letters from anti-creationists. 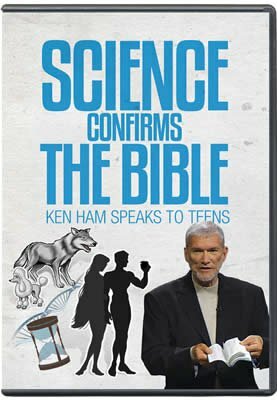 From my viewpoint in the U. K., I was encouraged by the dialog, even if I could not subscribe to all that the old-earth creationists were saying. In the U. K., our learned bodies such as The Geological Society forbid any kind of dialogue with creationists (Nield 2008). We are considered to be no better than flat-earthers. I took the plunge and wrote to the editor, pointing out that there was a fundamental practical point to the discussion which had not been addressed. If the origin of oil could not be explained by biogenesis or abiogenesis, then there was only one option left—creation. That letter was printed (Matthews 2006), but it brought the shutters down on the discussion. I found a similar conspiracy of silence in the U. K. oil industry. I joined over thirty years ago when I was an old-earth creationist. Within five years I had encountered Whitcomb and Morris’ (1961) book, and after a long gestation period had become a young-earth creationist. The geology I was discovering as a petroleum specialist was bringing me into contact with real geology, as opposed to the sterilized geology in textbooks and journal articles which often deal only with facts that do not compromise naturalism. There were many occasions when I put forward the view that the earth is young, life is created, and oil is also created. No one ever put any structured counterarguments forward. To summarize, the fact that the two major suggestions for explaining the origin of oil have numerous problems suggests that we have to rationally examine the idea that oil is theobaric (made by God). This suggestion will be examined under scriptural and technical headings. In the process we need to ask where and when God made it. For a moment we consider the geology in the Bible. There isn’t a lot, but it is crucial and sufficient to develop a third option for explaining the origin of oil. During the Creation Week, God created a mature earth. It remained relatively undisturbed until the Noachian Flood. The Garden of Eden had everything ready for its first occupants. There must have been mature plants and trees to supply food for immediate consumption. There must also have been partially grown plants which Adam and Eve would have to tend in order to supply food for the days ahead. It would mirror the tree of life described in Revelation 22 which produces a new crop each calendar month. The need for harvesting and storage is then much reduced. In fact, Genesis talks about harvests being a feature of life only while earth remains. We can only talk about these anthropomorphically, and further discussions are not germane to this note. Life without oil with the population we now have, and cold climates, would be almost impossible, even if we walked everywhere and/or used donkeys to save driving or flying. Consider how we use the components of oil. Methane is the smallest hydrocarbon. It is the main component of natural gas, which we use in our central heating. Ethane, which is number two in the sequence, is used for making the multi-purpose plastics. Propane and butane are next, and are valuable for portable heating because they are almost liquids under normal conditions. The next part of the alkane sequence are the hydrocarbons that make up petrol. Then comes diesel fuel, lubricating oil, and finally the asphaltenes. Each seems to have a purpose in life. Even helium is valuable because of its use for welding, and as an additive for compressed-air diving. My thoughts are that God, in His bounty, made hydrocarbons to meet our specific needs. Although the molecules that make up the hydrocarbons are complex,24 their complexity is miniscule compared with that of molecules (such as DNA) within living matter. So God would have no difficulty (I speak anthropomorphically to avoid arguments that I am invoking God of the Gaps) in making hydrocarbons. It also fits in with ideas expressed in Isaiah’s Song of the Vineyard ( chapter 5 ). God is seen as someone who prepared the earth fully for man’s habitation. The hydrocarbons are useful, not only as a fuel, but for their ability (through changing the carbon bonds around in the refinery) to be transformed into other conveniences of modern life, such as the plastics. Some kind of oil derivative was used by Noah to waterproof the Ark. We also have to recognize that, in the pre-Flood landscape (although we do not have detailed descriptions in the book of Genesis), we do know that a wide range of minerals were available for human use. We read of gold, onyx, soil,25 building materials (for cities),26 bronze and iron. The wide range of vegetation and the number of animal kinds also point to God who was liberal with his creative activity. So that although oil is not something simple (see earlier), the idea of God directly creating oil is not unreasonable when compared with other aspects of the young-earth creationist model. We turn our attention now to how the reservoirs where we now find oil are related to earth’s history, especially in the Flood. or was placed in deeper locations during Creation Week, and moved by standard hydraulic means into the target reservoirs during the Flood (Flood geology) whilst the “fountains of the great deep” were open. It would seem unusual for God to have created oil after the Flood. Whilst the Bible contains many examples of God actively creating new healthy limbs (for example, in some of the miracles of the New Testament) after the Creation Week, and oil (though surely comparable to a plant derivative rather than what we get out of the ground) for the Shunammite woman, that level of creativity is miniscule to what God did during the Creation Week. It would therefore seem more likely that God created oil during the Creation Week. There is a technical issue that seems to confirm God creating oil in the Creation Week. Oil in known reservoirs seems to have entered from deeper positions in the earth (Wilson 2005). We will examine the details later. The timescale needed for animal recolonization of the world, and their subsequent fossilization, requires an unacceptable stretching of biblical dating. There is often no provenance for the sediments. The Davisian cycle does not work (see previously). The enormity of geological events during recolonization. As an example, consider the dry valleys in what is commonly called Tertiary times compared with the paucity of evidence of rapid run-off of Flood water somewhere lower in the rock sequence. The fact that during the Flood the “fountains of the great deep” were closed, so no new deep water has since been delivered to the surface of the earth. To that extent we would expect a high degree of similarity between the salinity of the sea at the end of the Flood and that of the present day. The variability of the formation waters in reservoirs of many ages shows that that post-Flood emplacement of oil is not a convincing model. The most likely event that placed oil in the target reservoirs is the Flood. There are biblical and scientific reasons for this interpretation. We have suggested that oil was created by God in the beginning. What we have not discussed is the question where God put that oil. Noah had access to some of this oil,27 but that is all we know. The known evidence could be explained by suggesting that God created oil in deep primordial repositories during the Creation Week, and that it migrated upwards into present-day reservoirs during the Noachian Flood.28 Since the secular ideas on migration of oil are not viable (discussed previously), we need a new explanation for this vital part of the process. Whichever Flood model one adopts, intense geological activity will have occurred whilst the “fountains of the great deep” described in Genesis were active, though after day 150 of the Flood God said that the fountains were closed, so we would expect a sharp cut-off in hydraulic activity. During the Flood, the primordial repositories containing the hydrocarbons will have been breached and fluids released. Provided that the sedimentation was rapid, both in respect to the porous rocks and the cap rock, then most of the hydrocarbons could be trapped at shallower depths than the primordial repositories. If sideways sedimentation occurred, then the trapping of oil by the process discovered by Berthault (1986) would have been even more effective, because cap rock and reservoir rock would have been deposited at the same time.29 Whatever the true events, the new hydrocarbon emplacement model favors the short timescale associated with the 150-day period when the “fountains of the great deep” were active, rather than the post-Flood strata model where sedimentation takes place over many subsequent years. The author is not precluding the formation of oil reservoirs after day 150, since after day 150, in order to drain large tracts of land ready for rehabitation, significant tectonic events will have had to take place. We observe oil seeps (for example, see fig. 5) today when tectonic activity is limited. Some reservoir rocks will therefore have been deposited as a result of a Davisian type of sedimentation (though on timescales unbelievably short for Davis) and the hydrocarbons would have been released from lower temporary positions. Paleo-oil is one example of this. Even more significant are the blowout pipes being observed as a result of improved seismic surveys, as will be discussed. Cause and effect is not always unravelled in geology. One exception is synsedimentary faulting. Faulting, if it takes place in a watery environment, will give rise to sedimentary activity. Material may be eroded from the footwall of a normal fault, and deposited in the basin created by the hanging wall. Another example of a synchronous geo-event is when tectonic activity results in abnormal oil seeps at the surface. This is common in the fault zones on the western seaboard of the USA (Sibson 1990). These separate cause and effects may be illustrated by Fig. 9. What is not considered is whether all the three events are synchronous. The reality has to be that a single tectonic event could have the links shown in Fig. 10. Finally, if we reduce conventional timescales by 6 to 10 orders of magnitude, then the sedimentation is potentially fast enough to entrap the released oil. We can then complete the diagram as Fig. 11. Fig. 9. Synchronous geo-events as currently accepted. In this scenario, oil will also have the potential for release into the environment. If the reservoir cap material is deposited in a matter of hours after the reservoir sediments, then the loss will be small, and some of the escaping oil will be entrained in the cap rock (as in the Kimmeridge Clay). Sideways sedimentation, as suggested by Berthault (1986), would be an even more effective means of trapping oil. We briefly recap on the list of reservoirs described so far. The aim is to see how what we know about them fits in with the idea that theobaric oil moved into the reservoirs during short, though sometimes localized, bursts of sedimentary activity during the Noachian Flood. Capillary behavior30 within the reservoir and the distribution of illite in the Magnus reservoir is explained (see Matthews 2004). The high pressure of the Brae reservoir is now explained. Sedimentation of the conglomerates (200 to 500 meters of it) must have taken place within a matter of minutes to an hour or so. The source of the “cap rock” is already active (those sediments are inter-digitating with the Brae conglomerates). That sudden cessation of reservoir sediment31 simply allows the deposition of the Kimmeridge Clay to continue, trap some of the oil, and finally seal the Brae reservoir. Such abrupt cessation of the conglomerate sediment supply does not tie naturally with the diagram in Harris and Fowler (1987). The Ekofisk and Magnus reservoirs support this same interpretation. In Alba, the pressures are “normal,” but this is due to extensive remobilization of the sands which have penetrated the “cap rock,” thus releasing any original over-pressure. But the oil was already in the reservoir. While geological features such as kimberlite pipes have been mined below the level of the Precambrian basement (Holmes 1979),32 we now have a greater understanding of the earth’s structure because of improvements in seismic capability. For example, Cartwright (2007) shows examples of what he calls “blowout pipes” within the North Sea. Later he quotes diameters of 100 m to 3 km, and heights up to 2.5 km. Fig. 10. Synchronous geo-events showing additional linkages. These pipes are potentially the answer to Hogg, Selliers, and Jourdan’s (1992) question about the origin of hot acidic waters during deposition of the reservoir facies for Alwyn and Smørbukk that give rise to the fluid inclusions. They could be the conduits used by the “fountains of the great deep,” but if any over-pressured formations remained at the end of day 150 (when the “fountains of the great deep” closed) they may have had a less-catastrophic origin due to de-watering. Theological and physical objections have been raised against this theory that oil is “theobaric.” This section deals briefly with four key ones. Readers are welcome to contact the author for more details, or discuss their own points. Mention the word “God” in a science paper, and it is not likely to be printed. Gould (1999) came up with this idea of science and religion having their individual magisteria. Science and religion cannot be mixed. But the truth is that most people who object to the Bible do so, not on intellectual grounds, but because of its call to be obedient to the ways of God (Lennox 2007). Furthermore, Jesus never seemed to divide life into the secular and the sacred. This view is sustained in Romans 1:20 , where we are reminded that God’s invisible nature can be understood through what He has created. Disappointingly, some Christians fail to offer a consistent reason for their line of thinking, because young-earth creationism may be seen as going back to “the God of the gaps.” The issue has been addressed by Weinberger (2008), who argues that as long as the science is consistent with the Bible, then we should not worry about offering an explanation for phenomenon that science has no explanation for. After all, God does not try to prove His existence. He simply tells us that He is there. The science and the theology now form an impregnable position on the origin of oil. Fish survived outside the Ark during the Flood. Why not other things? Seeds and tree branches survived the Flood (to propagate the olive tree). So why not other things? God teaches us through recordable and observable events in the physical world. (Jesus, according to Luke, began to “do and teach.” Note the order!) If the Flood left no trace (so that the fossiliferous strata are post-Flood), then the biggest geological event after Creation breaks this pattern. Fig. 11. Synchronous geo-events showing development of an oil reservoir. In terms of the science, we have shown that oil reservoirs must have been deposited and filled during the Flood. Since, using uniformitarian terminology, reservoirs vary in age from Carboniferous to Tertiary, these strata and the ones in between must be Flood deposits, although it would be risky without further work trying to find boundaries for the pre-Flood landscape, day 40 (when the mabbul ceases), or day 150 (when the “fountains of the great deep” close), on the basis of material in this paper. There are occasions when fossils (including marine life) are reported to have an oily smell. The claim is made that this supports the biogenic origin of oil, and may be inconsistent with the model described above. The human nose can identify a small number of individual smells, but not with sufficient precision to identify the alkane 15 (which could have come from a biogenic oil) from the alkane 14, which cannot be explained (yet) by biogenic methods. 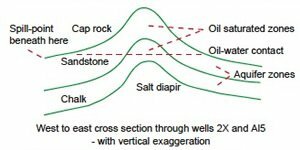 If the oil entered the reservoirs whilst sedimentation was proceeding, perfectly impervious cap rocks could not have been present to ensure that no oil was lost to the environment. Just as today, seeps of oil occurred, so some loss of oil to the environment would have occurred during emplacement. In the case of certain petroleum reservoirs, there appears to have been more petroleum in the cap rocks than in the reservoirs. Three mechanisms would have served to reduce the losses. First, there may have been a limited volume of oil released, governed by the physical size of the primordial repository. Second, the oil would have been migrating upwards into a rain of sediment downwards. This would have slowed the oil’s ascent to Darcy flow rates. Third, the cap rocks could have arrived like a focal-plane shutter on a camera. Why, if God created the oil and then it moved during the Flood, did He allow so much waste of oil in the cap rocks that we cannot access? We could as easily ask why God made so many galaxies. They have no effect on life now. Yet isn’t the oil to remind us that the Flood was real? Anderson, W. G. 1986. Wettability literature survey. Part 2: Wettability measurements. Journal of Petroleum Technology 48(11):1246–1262. Barker, C. 1996. Thermal modelling of petroleum generation: Theory and applications. Amsterdam: Elsevier. Barnard, P. C., and B. S. Cooper. 1983. A review of geochemical data relating to the northwest European gas province. In Geological and geochemical studies of the northwest European continental shelf, special publication 12, pp. 19- 33. London: The Geological Society. Barnard, P. C., and M. A. Bastow. 1992. Hydrocarbon generation, migration, alteration, entrapment and mixing in the central and northern North Sea. In Petroleum migration, eds. W. J. England, and A. J. Fleet, special publication 59, pp. 167–190. London: The Geological Society. Berthault, G. 1986. Experiments on laminations of strata. Comptes-Rendus Academy of Sciences Paris, Series II 303(17):1569–1574. Besley, B. M. 1998. Carboniferous. In Petroleum geology of the North Sea, 4th ed., ed. K. W. Glennie, pp. 104–136. London: Blackwell Scientific Publications. See also earlier editions. Bruce, R. H., M. F. Middleton, P. Holyland, D. Loewenthal, and I. Bruner. 1999. Modelling of petroleum formation associated with heat transfer due to hydrodynamic processes. In Coalbed methane and oil generation from coal, eds. M. Mastalerz, M. Glikson, and S. D. Golding, pp. 449–460. Kluwer Academic: The Netherlands. Bush, W. 2008. A Noah’s Ark zoo farm. Journal of the Biblical Creation Society (UK) 48:15–19. Cartwright, J. 2007. The impact of 3D seismic data on the understanding of compaction, fluid flow and diagenesis in sedimentary basins. Journal of the Geological Society, London 162:881–893. Chilingar, G. V., L. A. Buryakovsky, N. A. Eremenko, and M. V. Gorfunkel. 2005. Geology and geochemistry of oil and gas. Amsterdam: Elsevier. Collins, A. G. 1984. Properties of produced waters. In Petroleum engineering handbook, ed. H. B. Bradley, chap. 24. Richardson, Texas: Society of Petroleum Engineers. Cornford, C. 1998. Source rocks and hydrocarbons of the North Sea. In Petroleum geology of the North Sea, 4th ed., ed. K. W. Glennie, pp. 376–462. London: Blackwell Scientific Publications. See also earlier editions. Craig, F. F. 1971. The reservoir engineering aspects of waterflooding, monograph, vol. 3. Dallas, Texas: Society of Petroleum Engineers of AIME. Cubitt, J. M., W. A. England, and S. R. Larter, eds. 2004. Understanding petroleum reservoirs: Towards an integrated reservoir engineering and geochemical approach, special publication 237. London: The Geological Society. Cutts, P. L. 1991. The Maureen field—Block 16/29a, U. K. North Sea. In U. K. oil and gas—25 year commemorative volume, ed. I. L. Abbott, memoir 14, pp. 347–352. London: The Geological Society. Darwin, C. 1859. The origin of species by means of natural selection or the preservation of favoured races in the struggle for life. Reprinted as Senate paperback, 1994. De’Ath, N. G., and S. F. Schuyleman. 1981. The geology of the Magnus oilfield. In Petroleum geology of the continental shelf of north-west Europe, eds. L. V. Illing and G. D. Hobson, pp. 342–351. London; Institute of Petroleum. DeYoung, D. B. 2005. Thousands . . . not billions. Green Forest, Arkansas: Master Books. England, W. J. and A. J. Fleet, eds. 1992. Petroleum migration, special publication 59. London: The Geological Society. Fayers, F. J., R. I. Hawes, and J. D. Matthews. 1981. Some aspects of the potential application of surfactant or CO2 as EOR Processes in the North Sea. Journal of Petroleum Technology 33(9):1617 –1627. Glennie, K. W. ed. 1998. Petroleum geology of the North Sea, 4th ed. Blackwell Scientific Publications. See also earlier editions. Gold, T. 1979. Terrestrial sources of carbon and earthquake outgassing. Journal of Petroleum Geology 1(3):3–19. Gold, T. 1987. Power from the earth (Deep earth gas—energy for the future). London: Dent and Sons. Gold, T. G., and S. Soter, 1982a. The deep-earth-gas hypothesis. Scientific American 242(6):151–161. Gold, T. G., and S. Soter, S. 1982b. Abiogenic methane and the origin of petroleum. Energy Exploration and Exploitation 1(2):89–104. Gold, T. G., and S. Soter. 1984/5. Fluid ascent through the solid lithosphere and its relation to earthquakes. Pure and Applied Geophysics (PAGEOPH) 122:492–530. Goldsmith, P. J. 2000. Exploration potential east of the Troll Field, offshore Norway, after dry well 32/4-1. In Improving the exploration process by learning from the past, eds. K. Ofstad, J. E. Kittlesen, and P. Alexander-Marrack, NPF (Norwegian Petroleum Directorate) special publication 9, pp. 65–97. Amsterdam: Elsevier. Gould, S. J. 1999. Non-overlapping magisteria. In Leonard’s mountain of clams and the diet of worms. Essays on natural history. Jonathan Cape. Harris, J. P. and P. M. Fowler. 1987. Enhanced prospectivity of mid-late Jurassic sediment—South Viking Graben. In Petroleum geology of north west Europe, eds. J. Brooks, and K. W. Glennie, pp. 890–893. London: Graham and Trotman. Hogg, A. J. C., E. Selliers, and A. Jourdan. 1992. Cathodoluminescence of quartz cements in Brent Group sandstones, Alwyn South, U. K. North Sea. In Geology of the Brent Group, eds. A. C. Morton, R. S. Haszeldine, R. S. Giles, and S. Brown, special publication 61, pp. 421–440. London: The Geological Society. Holmes, A. 1979. Principles of physical geology, 3rd ed. London: Chapman and Hall. Hunt, J. M. 1979. Petroleum geochemistry and geology. San Francisco: Freeman. Hurst, A., J. Cartwright, D. Duranti, M. Huuse, and M. Nelson. 2003. Sand injectites: An emerging global play in deep-water clastic environments. In Petroleum geology: North west Europe and global perspectives, Proceedings of the 6th Petroleum Geology Conference, eds. A. G. Doré, and B. A. Vining, pp. 133–144. London: The Geological Society. Johnson, P. E. 1998. Objections sustained—subversive essays on evolution, law and culture. Downers Grove, Illinois: InterVarsity Press. Jones, A. 1998. Science in faith—a Christian perspective on teaching science. Romford, United Kingdom: Christian Schools Trust. Jourdan, A., M. Thomas, O. Brevart, P. Robson, F. Sommer, and M. Sullivan. 1987. Diagenesis as the control of the Brent sandstone reservoir properties in the greater Alwyn area (East Shetland Basin). In Petroleum geology of north west Europe, eds. J. Brooks, and K. W. Glennie, pp. 951–961. London: Graham and Trotman. Karlsen, D. A., J. E. Skeie, K. Backer-Owe, K. Bjorlykke, R. Olstad, K. Berge, M. Cecchi, E. Vik and R. Schaeffer. 2004. Petroleum migration, faults and overpressure. Part II. Case histories: The Haltenbanken petroleum province, offshore Norway. In Understanding petroleum reservoirs: Towards an integrated reservoir engineering and geochemical approach, eds. J. M. Cubitt, W. A. England, and S. R. Larter, special publication 237, pp. 305–372. London: The Geological Society. Katz, R. J., E. Mancini, and A. A. Kitchka. 2008. A review of the AAPG Hedberg Research Conference on origin of petroleum—biogenic and/or abiogenic and its significance in hydrocarbon exploration and production. AAPG Bulletin 92(5):549–556. Kettel, D. 1997. The dynamics of gas flow through rocksalt in the scope of time. In Hydrocarbon seals: Importances for exploration and production, eds. P. Møller-Pedersen, and A. G. Koestler, NPF (Norwegian Petroleum Directorate) special publication 7, pp. 175–185. Amsterdam and Singapore: Elsevier. Krauskopf, K., and D. Bird. 1995. Introduction to geochemistry. New York: McGraw Hill. Larter, S., and I. Horstad. 1992. Migration of petroleum into Brent Group reservoirs: Some observations from the Gullfaks field, Tampen Spur area, North Sea. In Geology of the Brent Group, eds. A. C. Morton, R. S. Haszeldine, R. S. Giles, and S. Brown, special publication 61, pp. 441–452. London: The Geological Society. Lennox, J. C. 2007. God’s undertaker—has science buried God? Oxford: Lion Books. Lerche, I. 1990. Basin analysis—Quantitative methods, vol. 1 San Diego: Academic Press. Matthews, J. D. 2004. Geological and physical assessment of the oil reservoir transition zone. Ph.D. thesis (unpublished), Imperial College, London University. Matthews, J. D. 2006. Forum letter. 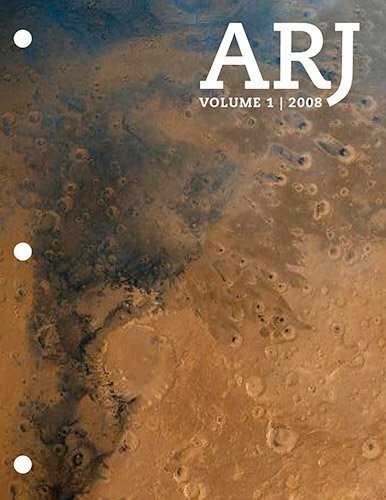 Explorer (American Association of Petroleum Geologists), January 2006. Matthews, J. D., J. N. Carter, and L. P. Dake. 1992. Investigation of optimum well spacing for North Sea Eocene Reservoirs. Society of Petroleum Engineers paper number SPE 25030 presented at the European Petroleum Conference in Cannes, France, 16–18 November, 1992. Matthews, J. D., R. E. Hawes, I. R. Hawkyard, and T. P. Fishlock. 1988. Feasibility of waterflooding gas-condensate reservoirs. Journal of Petroleum Technology 40(18):1049– 1056. Matthews, J. D., J. N. Carter, K. D. Stephen, R. W. Zimmerman, A. Skorstad, T.. Manzocchi, and J. A. Howell. 2008. Assessing the effect of geological uncertainty on recovery estimates in shallow-marine reservoirs: The application of reservoir engineering to the SAIGUP project. Petroleum Geoscience 14:35–44. Matthews, J. D., J. N. Carter, and R. W. Zimmerman. 2008. Using drill-stem tests to model relative permeabilities. Society of Petroleum Engineers paper SPE 107209 presented at the Offshore Europe Conference, Aberdeen, September 2007. Society of Petroleum Engineers Reservoir Engineering, in press. McKie, T., J. Agget, and A. J. Hogg. 1998. Reservoir architecture of the upper Sherwood Sandstone, Wytch Farm field, southern England. In Development, evolution and petroleum geology of the Wessex Basin, ed. J. R. Underhill, special publication 133, pp. 399–408. London: The Geological Society. Møller-Pedersen, P. and A. G. Koestler, eds. 1997. Hydrocarbon seals: Importances for exploration and production, NPF (Norwegian Petroleum Directorate) special publication 7. Amsterdam and Singapore: Elsevier. Moretti, I. 1998. The role of faults in hydrocarbon migration. Petroleum Geoscience 4:81–94. Nield, T. 2008. Fighting the good fight or just slaying the slain? Geoscientist 18(1):2. London: The Geological Society. Oakman, C. D., and M. A. Partington. 1998. Cretaceous. In Petroleum geology of the North Sea, 4th ed., ed. K. W. Glennie, pp. 294–349. London: Blackwell Scientific Publications. See also earlier editions. Okui, A., R. M. Siebert, and H. Matsubayashi. 1998. 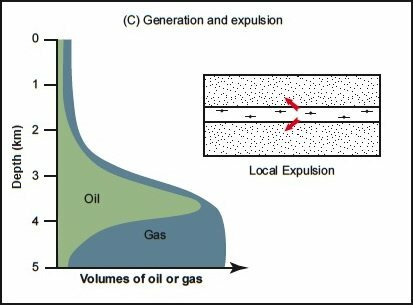 Simulation of oil expulsion by one-dimensional and twodimensional basin modelling—saturation threshold and relative permeability of source rocks. In Basin modelling: Practice and progress, eds. S. J. Duppenbecker, and J. E. Illife, special publication 141, pp. 45–72. London: The Geological Society. Osborne, D. 1986. A world awash in oil. Management Today, Nov/Dec, pp. 41–45, 108, 112, 115 and 120. Petford, N. and K. J. W. McCaffrey, eds. 2003. Hydrocarbons in crystalline rocks, special publication 214. London: The Geological Society. Popper, K. R. 1994. The myth of the framework. London: Routledge. Potter, J., and J. Konnerup-Madsen. 2003. A review of the occurrence and origin of abiogenic hydrocarbons in igneous rocks. In Hydrocarbons in crystalline rocks, eds. N. Petford, and K. J. W. McCaffrey, special publication 214, pp. 151–173. London: The Geological Society. Richards, P. C. 1992. An introduction to the Brent Group: A literature review. In Geology of the Brent Group, eds. A. C. Morton, R. S. Haszeldine, R. S. Giles, and S. Brown, special publication 61, pp. 15–26. London: The Geological Society. Roberts, W. H., and R. J. Cordell. 1980. Problems of petroleum migration. AAPG Studies in Geology 25:455–472. Schutter, S. R. 2003. Hydrocarbon occurrence and exploration in and around igneous rocks. In Hydrocarbons in crystalline rocks, eds. N. Petford, and K. J. W. McCaffrey, special publication 214, pp. 7–33. London: The Geological Society. Selley, R. C. 2005. U. K. shale-gas resources. In Petroleum geology: North west Europe and global perspectives, Proceedings of the 6th Petroleum Geology Conference, eds. A. G. Doré, and B. A. Vining, pp. 707–714. London: The Geological Society. Selley, R. C., and R. Stoneley. 1987. Petroleum habitat in south Dorset. In Petroleum geology of north west Europe, eds. J. Brooks, and K. W. Glennie, pp. 139–148. London: Graham and Trotman. Sibson, R. H. 1990. Conditions for fault-valve behaviour. In Deformation mechanisms, rheology and tectonics, eds.R. J. Knipe, and E. H. Rutter, special publication 54, pp. 15–28. London: The Geological Society. Smith, N. J. P., T. J. Shepherd, M. Styles, and G. M. Williams. 2005. Hydrogen exploration: A review of global hydrogen accumulations and implications for prospective areas in NW Europe. In Petroleum geology: North west Europe and global perspectives, Proceedings of the 6th Petroleum Geology Conference, eds. A. G. Doré, and B. A. Vining, pp. 349–360. London: The Geological Society. Tissot, B. P., and D. H. Welte. 1978. Petroleum formation and occurrence—A new approach to oil and gas exploration. Berlin: Springer-Verlag. Turner, C. C., J. M. Cohen, E. R. Connell, and D. M. Cooper. 1987. A depositional model for the South Brae Oilfield. In Petroleum geology of north west Europe, eds. J. Brooks, and K. W. Glennie, pp. 853–864. London: Graham and Trotman. Underhill, J. R., and R. Stoneley. 1998 Introduction to the development, evolution and petroleum geology of the Wessex Basin. In Development, evolution and petroleum geology of the Wessex Basin, ed. J. R. Underhill, special publication 133, pp. 1–18. London: The Geological Society. Vejbæk, O. V., P. Frykman, N. Bech, and C. M. Nielson. 2005. The history of hydrocarbon fillings of Danish chalk fields. In Petroleum geology: North west Europe and global perspectives, Proceedings of the 6th Petroleum Geology Conference, eds. A. G. Doré, and B. A. Vining, pp. 1331– 1346. London: The Geological Society. Waples, D. W. 1998. Basin modelling: How well have we done? In Basin modelling: Practice and progress, eds. S. J. Duppenbecker, and J. E. Illife, special publication 141, pp. 1–14. London: The Geological Society. Warren, E. A., C. P. Smalley, and R. J. Howarth. 1994. Compositional variation of North Sea formation waters. In North Sea formation waters atlas, eds. F. A. Warren and P. C. Smalley, memoir 15, pp. 119–208. London: Geological Society. Weinberger, L. 2008. Whose god? The theological response to the god-of-the-gaps. Journal of Creation 22(1):120–127. Whitcomb, J. C., and H. M. Morris. 1961. The Genesis Flood—The biblical record and its scientific implications. Philadelphia, Pennsylvania: Presbyterian and Reformed Publishing Co.
Wilson, H. H. 2005. A review of the geological data that conflicts with the paradigm of catageneic generation and migration of oil. Journal of Petroleum Geology 28(3):287–300. Zoback, M. D., and J. C. Zinke. 2002. Production-induced normal faulting in the Valhall and Ekofisk fields. Pure and Applied Geophysics 159:403–420. I have used Gold’s lists, not because they are the only ones available, but because they are one of the more comprehensive lists. Porosity within igneous rocks also exists, though the mechanisms for creating it are not so obvious. A particular problem of explaining the oil filling the Machar field is given in Oakman and Partington 1998, p. 344. He believes that oil has a biogenic origin. This sounds like a secular description of the activity of the biblical “fountains of the great deep” during the Noachian Flood. How otherwise do we get such high temperatures at shallow depths? Temperatures in the range 120–140°C require depths of several miles, or even deeper if the fluids are expelled slowly because they would then have a chance to cool on their upward journey. The U. K. uses about two million barrels of oil per day. Each barrel is 5.6 cubic feet or around 35 imperial gallons. The author is not endeared to the geological column names, but uses them for compatibility with the quoted texts. This sounds like another secular description of the “fountains of the great deep”. If it isn’t, one wonders what the implied rainfall would be and why it ceased abruptly twice. Clearly, the authors have to accept the uniformitarian premise that the present is the key to the past. One explanation offered for reservoir high pressures is that as biological matter turns into kerogen and then into oil and gas, the resulting hydrocarbons occupy a larger volume than the precursor material. This, of course, becomes an unsatisfactory answer if oil is not generated in this way. There is little or no barium or strontium in seawater, probably because of the presence of sulfate which forms an insoluble salt with these two anions. n a straw poll I conducted at the Sixth Petroleum Geology Conference in London in 2003, it was the view held by 80% of those present at a particular session. In Eastern Block countries, the statistics are roughly the opposite way round, because so many of their reservoirs are underlain by crystalline rock. Terrestrial plant can be used to generate certain oil molecules in the laboratory, but the quantities and types are smaller than those from marine organisms. 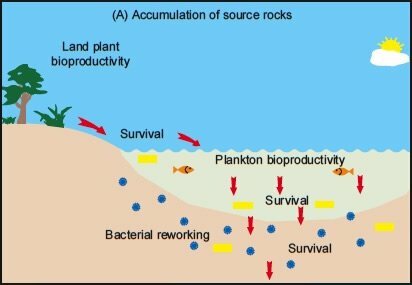 If we cannot make the biogenic model of the origin of oil work with the marine organisms, then referring to the oil-generating properties of plant matter is diverting our attention away from the other significant problems with the biogenic model. It is worth noting at this stage that Bruce et al (1999) have used the idea that hydrothermal fluids of substantially higher temperatures than the surrounding rocks could have allowed the catagenesis to occur in a short timescale consistent with a young-earth model. Unfortunately, that idea does not solve the remaining problems with the whole biogenic model. Surfactants consist of a series of molecules which have hydrophilic (water-loving) heads and hydrophobic (water-hating) tails. Simple detergents are examples. They cause the oil to swell by drawing water into globules of oil. There is some evidence that small quantities of surfactants exist in reservoir formation waters, but the volumes are small. I was present during the proceedings. The figure is somewhat simplified. For details the reader is referred to Selley and Stoneley (1987). This sounds like the “fountains of the great deep” again. For a basic discussion about the wettability of reservoir rocks, see Craig (1971), There is a more extensive discussion in Anderson (1986). Whilst both of them show that water-wettability can be reversed (so that the rock becomes oil-wet) particularly when there are polar compounds in the oil, the wettability reversal takes 100 or more hours. If we are working with a Flood geology model we do not have time for that to happen in individual sections of the rock record. There is a risk of circular reasoning here by these authors. For example, they may have considered that because there is a lack of known local source rocks or specific δ13 signatures in the oil, then an abiogenic origin is the only option left because a biogenic option has been ruled out. The two articles do not agree on all details. The soil would have to include a range of soluble minerals and compounds of calcium, potassium, phosphorus and the nitrates so that farming could continue. Would this have included limestone, sandstone and clay—the latter being another complex mineral made by God? The pitch with which he covered the Ark. This idea is a new paradigm even for creationists. Our knowledge of the interior of the earth does suggest that God shaped it and made it in a particular way to assist life. An example is the creation of the dynamo which supplies earth’s magnetic field—vital for navigation for thousands of years and keeping cosmic radiation from reaching the earth. Any example of diachronous sedimentation is in a sense a justification of Berthault’s findings. The Brent reservoirs contain many diachronous deposits (Richards 1992) whose origin is a puzzle in a uniformitarian system. Furthermore, when the Flood began, all life-forms were present possibly in dispersed ecological niches, so a circularity of arguments can easily arise if one attempts to use fossils as exact time lines within sediments. Local correlation would be possible, but global correlations less certain. This is a subtle reservoir engineering issue which has puzzled the upstream oil industry for 50 years. That “relatively rapid waning of coarse-clastic supply to the fan” noted earlier. Holmes suggests that the kimberlite material has risen through the pipes having come from depths of up to 110 km, though current evidence suggests even deeper source areas in the mantle.